Ever since computerized accounting first appeared, companies have been competing to deliver detailed and up-to-date insights, and to give users control over a wide range of metrics and indicators. The failure of many of these systems, nevertheless, revealed how sometimes it is better to work around the basic capacity users need and expect, instead of launching expensive projects that may compromise the efficiency you promised to deliver. That’s how FreshBooks attracted our attention in the first place: it built upon the simplest concept possible, looked at the most complex problems its users could not solve, and developed a streamlined solution for them. In this article, we take a detailed look at FreshBooks pros and cons to give you a better understanding of its capabilities so you can decide if it’s actually a solution fit for your needs. Nowadays, FreshBooks is the preferred accounting system of 5 million companies and freelance accountants, many of which are prominent world brands. Our review team acknowledged its financial management competence by giving it a high score in our accounting software category. A deeper look on its extraordinary features will most certainly give you a clearer picture of the reasons that led to our final results. What is more, if you’re unconvinced you can always try a 30-day FreshBooks free trial to examine all the key features first. FreshBooks grew from a small, business-friendly accounting tool to an enterprise-grade financial asset, and now it has an advanced version available next to the classic one. The easiest way to describe the software is “fast and reliable”, which despite being two simple and often-met attributes, mean the world to a system handling that amount of financial information. In a nutshell, FreshBooks offers billing, invoicing, and exclusive reporting, and gathers payments right where the invoice was received, lined up, or modified. And while some of you may still think this is not that much of an advantage, we believe Freshbooks has indeed made it possible for small businesses to customize accounting to their needs. Long story short, FreshBooks brings all power of automated accounting in an intuitive package, and supplies users with a variety of enterprise-grade features. Just recently, FreshBooks introduced a new product suitable for enterprise-grade users, and we couldn’t be happier about its new advanced search & reporting features, painless tax summaries, and the variety of payment options now it allows to use. Similarly to the classic version, users can receive payments via PayPal, Google Checkouts, MasterCard, Visa, and a few more systems. At the same time, the system is reasonably priced and therfore very suitable for freelance accountants as well. Integrations are available for each package, and so is unlimited access and accounting operability on all devices. What users also praise Freshbooks for is its technical support, as the system can really be proud of its knowledgeable technical team which seems to always be there to support users. 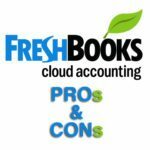 All arguments speak in favor or choosing FreshBooks as your new accounting manager, but we still suggest that you go through the FreshBooks pros and cons listed below first, and possibly check the free trial first to make sure it is the right solution for your business. Many people didn’t even believe intuitive accounting existed before getting acquainted with this system. With its well-organized dashboards and single-click functions, FreshBooks is definitely one the easiest financial management tool on the market, and we can sincerely recommend it to non-accountant users as well. Once roles and permissions are dealt with within the system, managing data access becomes a breeze. FreshBooks certainly didn’t neglect the mobile trend, and delivered mobile-platform add ons for active users to do accounting regardless of their location. The operation system won’t matter – FreshBooks works equally well Windows and Mac as well as on iOS and Android devices. What is more, it comes with a super cool Projects suite for communication where remote teams can easily consult on important financial questions. It also allows for fast communication with partners and other involved parties. Or few steps ahead, actually. With it all companies can accept payment online, and choose between PayPal, Visa, MasterCard, Google Checkouts, and Amex, and thanks to trigger notifications and set alerts for late payments the risk of disputing invoices with clients is almost minimal. The main benefit here is that the company gets to charge late payment fees as it has sent an overdue reminder and made sure clients got it. Thanks to it, companies can track current and past invoices, and will in all situations stay in control of their cash flow. Not many accounting apps offer such functionalities. Even novice users will quickly realize that FreshBooks is priceless for charge accuracy, in particular where users charge hourly rates to their clients. Don’t forget though that you can also charge flat rates if you prefer – it takes just a few clicks to calculate a running bill. As for the expenses you wish to liquidate after meeting a client, you should consider the system’s handy snaps thanks to which you can connect users with invoices, or import expenses directly from your bank using the simplified Expense Tool. We strongly believe that great reporting features are one of the best aspects of FreshBooks. The system will ensure your accounting is error-proof and less time consuming, and that all balance sheets are monitored in real time. Reports can be generated with just a few simple clicks, and offer a variety of useful filters for profit/loss and taxation statements. The process is completely automated, and final reports can easily be exported to every format, and at any point in time. How often do you get to buy a system that updates on a regular basis? After monitoring its development for over the years we are really impressed with the technical advancement this system has achieved in that time, particularly in the area of introducing a whole new enterprise-user version. FreshBooks team actually ensured users will have access to a number of modern prioritization features, advanced reporting, and late payment management without sacrificing the simple interface that has become a trademark for this system. It looks like their team constantly works on developing new features, That’s why we’re positive that FreshBooks is only at the dawn of its development, and will offer way more features in the near future. Despite being the best accounting solution we tested so far Freshbooks there are a few small areas that could be improved. The first problem may be the fact it still lacks some enterprise-grade capacity. However, as we already discussed, this was already partially addressed when the company introduced an enhanced new version that offers much more enterprise level features. Rapid development of their service also suggest that more and more such features will become available in the future. Another small issue is that some users don’t seem to know that their invoices won’t be automatically transferred from other systems such as QucikBooks, and that they will have to enter them manually in order to modify them. Depending on the situation, this can be both good and bad, but it’s not a problem that would compromise the accounting in any way. Minor bugs and glitches from time to time but it’s nothing that would interrupt the work process to the user. As a matter of fact, the frequency of little glitches is even lower than in some other popular services that we tested.